Knit down is a sample of knit fabric pattern of dyed yarns (may be a check or stripe pattern) used for color approval as well as pattern approval. (e.g. Sweater or any other knitted fabric made of dyed yarns). 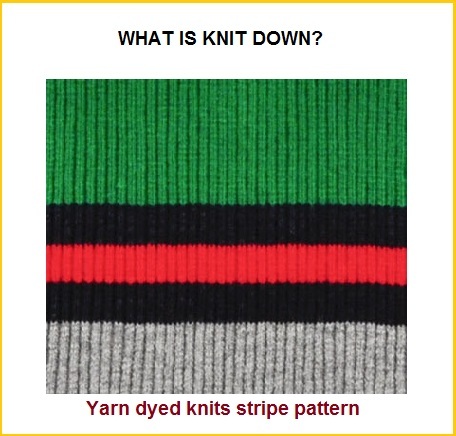 Suppliers develop knit downs in knitting mills, and match the pattern prior to submitting the knit down to buyer. Colors of the dyed yarns may be approved prior to knitting (in yarn dyeing stage). Buyer request for knit down to their suppliers or mills to submit it and take approval before production run. Knit-downs may be required when ordering a new yarn for sampling. Online Clothing Study: What is Knit down? The meaning of knit down in apparel sourcing.